This coming Saturday (January 18th 2014) I'll be dedicating my 16 miler to a woman I've never met but, as a fellow runner and mom, I felt a certain kinship with..although I doubt I'll ever qualify for Boston (as Meg did this past year). Meg Cross Menzies was a 34 year old mom of three who was out for her morning Boston training run, (which with 3 kids, was probably the only time she had to run) when she was struck and killed by a drunk driver. This could happen to any of us. I've read other stories like this, one of a young student teacher who was crossing the road and was struck by an inattentive driver, throwing her to a neighboring yard where she died in the arms of one of her professors who witnessed the whole thing. Another where a woman was struck and left by the side of the road, a victim of a hit and run. (And yes I've read stories like this about men-but because I'm a woman maybe-these ones stick with me). It's shown me that no matter what age, experience or running speed you have, the worst can happen. It has taught me to pay much more attention when I run on the roads-I've given up being embarrassed by my waving and peace signs when I communicate my intentions to a driver and they nod in understanding (they get a peace sign if they don't give me the middle finger). If that doesn't happen I assume they can't see me and I look to the next car back to have the same sign-language conversation until I can go ahead safely. A few seconds isn't worth me being hurt or worse. I can't say exactly what happened this past Monday when Meg went on her run. Maybe she had the same conversation I do with the drivers and instead of staying put Dr. Carlson (who has been charged with involuntary manslaughter and driving under the influence) pressed on the gas leaving a husband without his wife and three children without their mom. 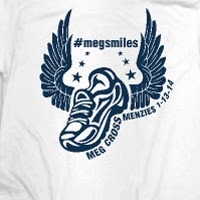 Organizers have called this Virtual Run this Saturday Meg's Miles. You can find it on Facebook where you can pledge to dedicate this Saturday's running or walking miles to Meg. They ask "no matter what your distance, no matter where you live, run for Meg. Take in the fresh air, be aware of your surroundings, keep your headphones on low, feel the heaviness in your lungs, the soreness in your legs, and be grateful for it--for all of it. The sweat, the pain, the wind, the cold…everything. Be grateful for that moment." I will and I hope you will too.